Like any successful genre film, Predator would remain in the consciousness of filmgoers during the late 80’s. The film was that popular and successful. This also meant that the studio who produced and released the film were more than happy to try and replicate what made them a lot of money. So, a sequel was quickly greenlit within the halls of 20th Century Fox. Yet, despite the success the first film was able to garner despite some major production problems, this time around luck wasn’t with Predator 2. The follow-up film would have different production issues than the first but they would affect the film in the long run. First off, John McTiernan wouldn’t be on-board to direct the sequel. His back-to-back successes with Predator and Die Hard has suddenly made him a coveted action director. His schedule would keep him from directing Predator 2 as his slate was already full with The Hunt for Red October being his next film. In comes Stephen Hopkins to helm the sequel. Yet, the biggest blow to the production would be not being able to get Arnold Schwarzenegger to return in the role of Dutch, the sole survivor of the elite rescue team from the first film. As with most stars and sequels, this time it would be over a salary dispute that would keep Arnold from returning so in comes Danny Glover to take on the sequel’s lead role. Now, Danny Glover has more than pulled his own action film weight with two Lethal Weapon films already under his belt, but in terms of on-screen charisma he would be a major downgrade from the presence Schwarzenegger provided the first film. But Glover was more than game to take on the role of Lt. Harrigan of the LAPD as the setting for the sequel moves from the steaming jungle canopy of Central America to the blistering asphalt and concrete jungle of gang-ridden Los Angeles. This change in location made for an interesting take as it helped establish some world building that showed these Predators have visited Earth many times in the past and not just in the faraway jungles but more towards areas and places rife with conflict. We learn that it hunts those who have survived the conflicts of the area they’re in. Only the strongest for these extraplanetary hunters. Predator 2 suffers from a lot of that as the film feels more than just a tad bit bloated. The Thomas brothers (Jim and John) who wrote the original film return for the sequel but were unable to capture lightning in a bottle a second time around. Where the first film was very minimalist in it’s narrative and plot, the sequel goes for the throw everything in but the kitchen sink approach. We have warring drug gangs, inept police leadership, secretive government agencies with their own agendas. What does work with Predator 2 and has made it into a cult classic as years passed was the very worldbuilding I mentioned earlier. We learn a bit more of this predator-hunter. While some comes as exposition from Gary Busey’s special agent role Peter Keyes, the rest comes from just seeing the new look of this particular Predator courtesy of special effects master Stan Winston. The biggest joy for fans of the films comes in an all-too-brief scene showcasing the trophy case of the Predator inside it’s spacecraft. Within this trophy case are the skulls of the prey it’s hunted and killed. One skull in particular would ignite the imagination of scifi action fans worldwide. It’s a skull of a xenomorph from the Alien franchise. It made fans wonder if the two films were part of a larger tapestry. Both properties were owned by 20th Century Fox, so there was a chance and hope that the two meanest and baddest alien creatures on film would crossover together. It would be many, many years before such a team-up would happen. Even when it finally did fans of the franchises would be let down with what they get after waiting for over a decade. Predator 2 could be seen as trying to make lightning hit the same patch twice or it could be seen as a quick cash grab by a studio seeing a potential franchise. Both are true and without its two biggest stars, Arnold Schwarzenegger and John McTiernan, returning to reprise their roles for the sequel the film was already behind the eight-ball before filming began. While the follow-up had some interesting new ideas that helped round out the Predator as one of film’s greatest onscreen villains, it also failed to capitalize on those ideas in a creative way. There’s some good in Predator 2, but way too much baggage and too much bad to have it live up to the success and popularity of the original. 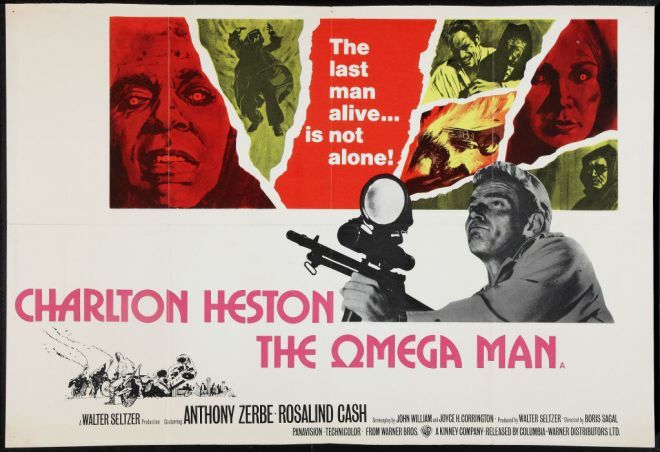 When I was a lad of 13, back in the Stone Age, I saw THE OMEGA MAN on the big screen during it’s first run. I remember thinking it was real cool, with Charlton Heston mowing down a bunch of mutant bad guys with his sub-machine gun, some funny one-liners, and a few semi-naked scenes with Rosalind Cash. What more could an adolescent kid ask for in a movie? Now that I’m (ahem!) slightly older, I recently re-watched the film, wondering just how well, if at all, it would hold up. It’s been a year since Through the Shattered Lens lost one of it’s own: Semtexskittle. In honor of his passing I’d like to share one of the films he and I share a love for. I think he may have been one of the few who truly wanted this film to be nominated as one of the ten films picked for Best Picture for the year it came out. While the Academy voters were sorely shortsighted for not nominating the film, it still remains one thing Chris shared with everyone at the site. Whether it was his love of sports, anime, video games and everything in-between. We all still miss you, Chris.